Sakai Guides and DocumentationAssessments and Grading AssessmentsHow do I publish an assessment (i.e. test or quiz)? After you have created an assessment, you must publish it before students can view and submit it. Go to Tests & Quizzes. 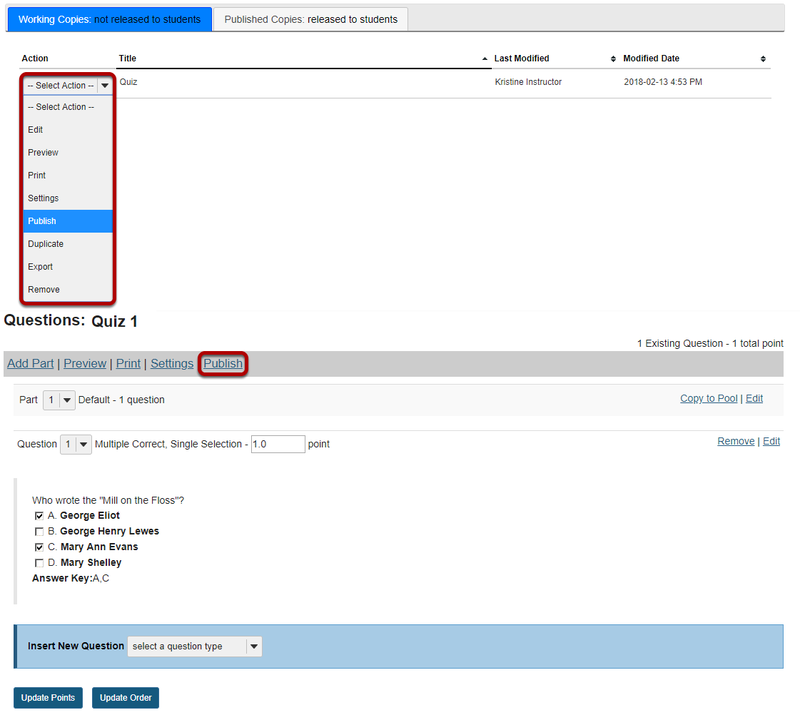 Select the Tests & Quizzes tool from the Tool Menu of your course. If you are sure that the default or current settings are appropriate, you can publish from either the action menu or the edit assessment screen. Zoom: Publish with current settings. Edit the settings and then publish. Zoom: Edit the settings and then publish. From the Tests & Quizzes tool home screen, choose the Settings option in the drop-down menu for the quiz you would like to publish. Be sure that you are in the Working Copies tab, otherwise, you won't see your unpublished items. Alternately, you can access assessment settings from the edit assessment screen. 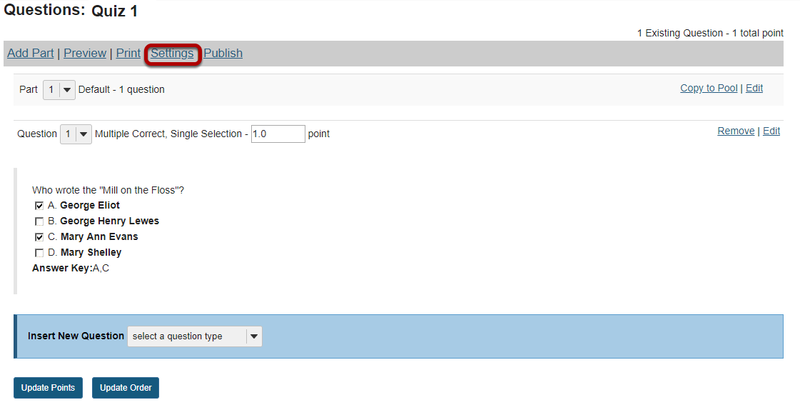 Zoom: Alternately, you can access assessment settings from the edit assessment screen. If you are currently editing the quiz in question, click the Settings link at the top of the assessment editing screen. Adjust the settings as desired. See the article How do I view and modify the settings of an assessment? Note: Settings are typically adjusted fully on the Working Copy before publishing. Once you have completed all of your settings selections, click the Save Settings and Publish button at the bottom of the screen. Note: You may also choose to Save settings without publishing, or Cancel to cancel the assessment settings. Review and confirm publishing of assessment. Zoom: Review and confirm publishing of assessment. You have the option to notify students when you publish the assessment. The default setting is without notification. Notifying students sends and email to their external email address to let them know the assessment has been published. It sends the message at the time of publication, NOT on the start date of the assessment. If your assessment has an end date, you may select to Display due date on Calendar. This will post an event on the Schedule/Calendar for the course on the date the assessment is due. Click Publish to make the assessment available to students. Click on Published Copies to view your published assessments. Published assessments will be displayed in the list, along with the status, submission and release information, and the user that last modified the item. Prev: How do I adjust the layout and appearance of an assessment? Next: How do I duplicate an assessment (i.e. test or quiz)?